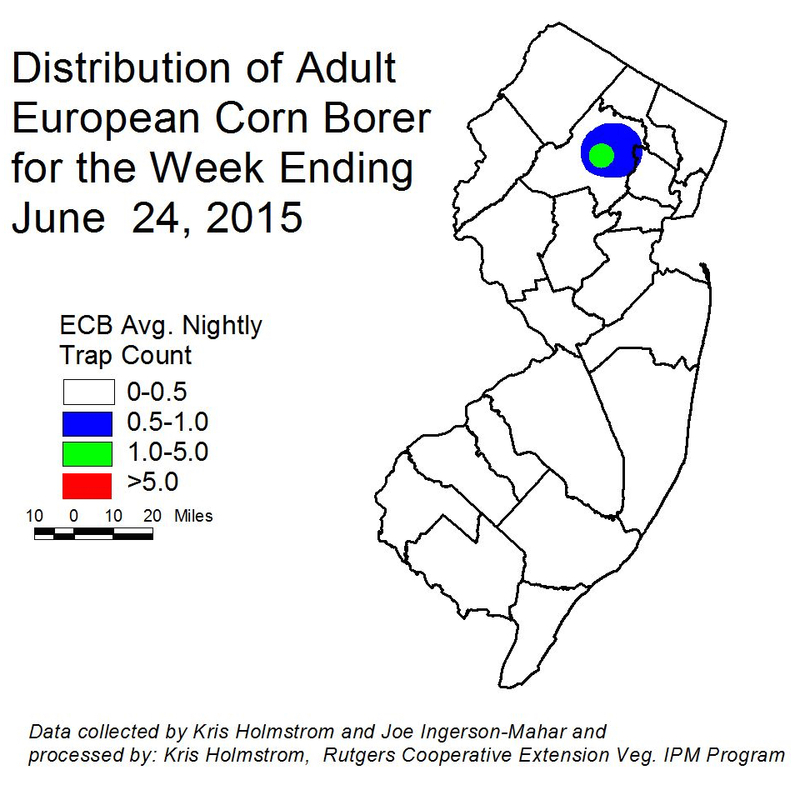 European corn borer (ECB) adult activity is now very low. Only scattered individuals remain in northern NJ, while the activity in the southwestern part of the state has declined to nearly nothing. The first flight is over in most of NJ. Areas of highest activity is in parts of Morris County (see ECB map). ECB infestations are still present in sweet corn plantings. Feeding in pretassle stage plantings in the 30% range has been found in areas where IPM personnel are operating. Be sure to begin monitoring plantings for ECB feeding while they are still in the whorl stage. Consider treating when the number of infested plants in a 50 plant sample exceeds 12%. Feeding in the whorl stage will appear as numerous small holes (called “shot-hole”) on leaves, with damage present on consecutively younger leaves. 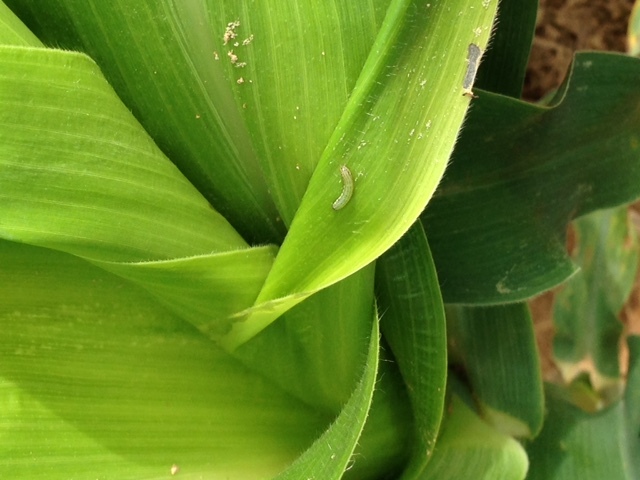 As plants progress to pre-tassel and beyond, the actual larvae may be found in or on the emerging tassels. Any planting remaining at or above threshold as it proceeds to full tassel should be treated, as this is the last stage at which ECB larvae will be exposed and vulnerable to insecticidal sprays. Insecticides that are acceptable in organic production include the spinosyn based material Entrust (IRAC-5) and Dipel (IRAC-11a). The 10G formulation of Dipel is particularly useful when granules can be dropped or broadcast such that they get into the whorls of corn plants. See the 2015 Commercial Vegetable Recommendations Guide for more insecticide choices. 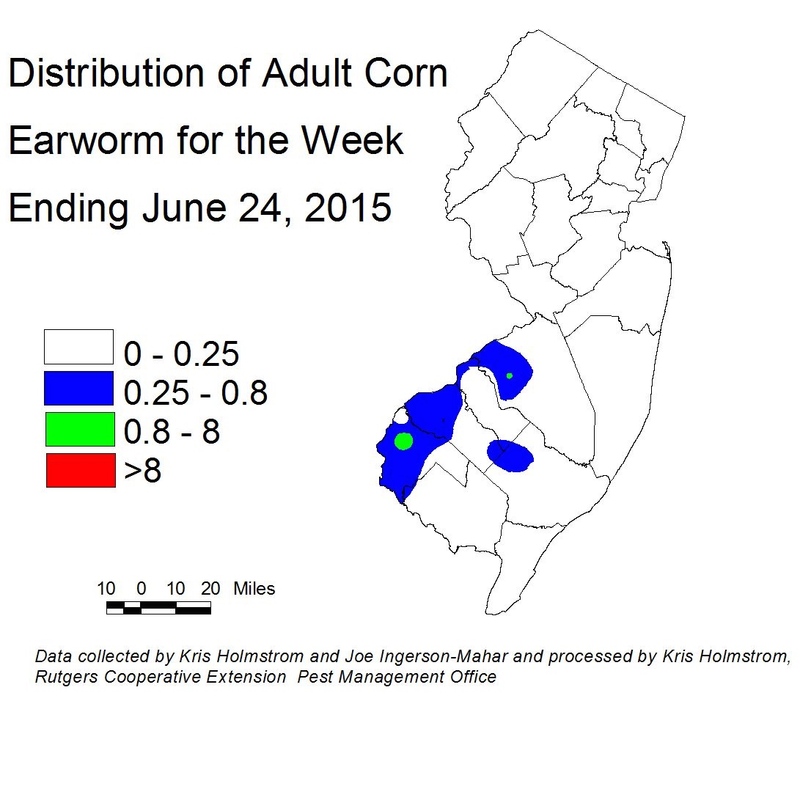 There has been a shift in catches of corn earworm moths (CEW) to the west in blacklights this past week. This adult activity is primarily focused along the lower Delaware River (see CEW Map). The limited number of CEW pheromone traps deployed throughout the southern counties have captured fewer adults over the past week. There is a great deal of agreement this week between CEW blacklight and pheromone trap maps (see CEW pheromone map). With many sweet corn plantings now in silk, it is critical that growers monitor local CEW moth numbers. For the present time, any sweet corn plantings entering the silk stage should be treated to limit CEW injury as well as to prevent ear damage from ECB larvae that already inhabit the stalks. 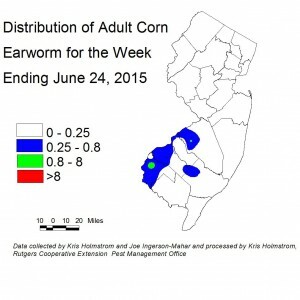 Low level fall armyworm (FAW) infestations have been discovered in southern NJ and in Warren County. These infestations are very low, and limited to smaller whorl stage plantings. It is likely that the moths responsible for these infestations were deposited by storms passing over us last week. Very few FAW moths have been captured in the region, so the threat of increased infestations in the near term seems low. 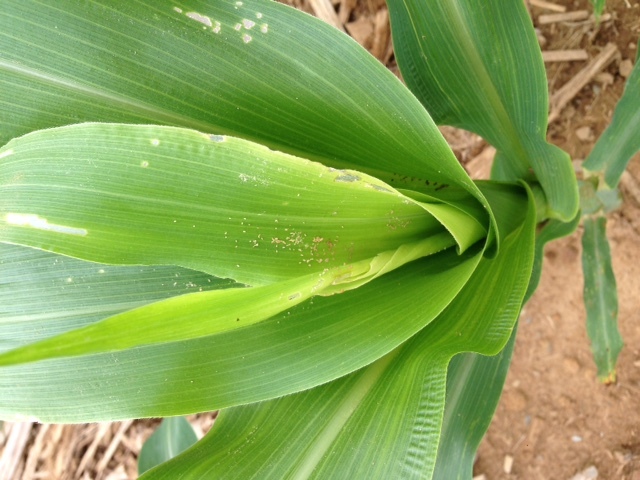 However, this pest can be devastating to small corn plants. Fields down to seedling stage should be scouted weekly for signs of infestation. 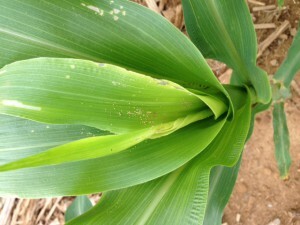 FAW larvae cause more dramatic feeding injury than does ECB (see photos). Early feeding injury from small FAW larvae. Small FAW larva in whorl stage corn. Larvae are green until they have molted more than once, at which point they are tan and brown in color. As they grow, FAW create large holes in foliage, with damage leading down into the whorl. Large amounts of feces may be present in the whorl. Consider treating if the number of plants infested with FAW either alone, or in combination with ECB exceeds 12%. FAW may be difficult to control with pyrethroid insecticides. Newer materials, including spinosad-based insecticides (Entrust, Radiant), as well as those including active ingredients chlorantraniliprole (Coragen) and flubendiamide (Belt) (IRAC-28) are effective against FAW. No weevils have been trapped in the past week at either produce businesses or farm fields and none have been caught since May 22nd. As far as known there are no field infestations at this time. Potato leafhopper (PLH) adults have appeared in snap beans in the northern and central counties this week, and should be considered present in all areas. This pest is a particular problem because it often goes unnoticed until foliar distortion and burn occurs. Once this damage appears, yields have already been compromised. It is critical that beans be monitored regularly for the presence of PLH. If a sweep net is available, consider treating if more than 100 nymphs and adults are present in 20 sweeps of pre-bloom stage plants. This threshold increases to 250 during bloom and to 500 per 20 sweeps during pod development. If no sweep net is available, check plants in 10 random field locations and consider treating if adults and nymphs are found throughout. Adults are pale green, and will fly out from foliage when disturbed and immediately fly back into the plant canopy. Nymphs are wingless and bright green and may be found on the underside of leaves. Recent rains have resulted in the appearance of bacterial leaf spot (BLS) in several northern NJ tomato plantings. BLS appears as small, very dark lesions on young and older leaves, often causing some distortion where leaves were not fully expanded when the infection started (see photo). It is important to treat preventively for bacterial infections. Timing and rates for applications of copper and/or the plant defense activator Actigard are detailed in the 2015 Commercial Vegetable Production Recommendations. These products provide some suppression of bacterial pathogens. Pruning and tying of plants is on-going. Remember that any event that results in contact with the plant causes numerous injuries to them (this includes hail injury). While these injuries heal, they serve as avenues of entry for bacterial pathogens that may be present either on the plants or in the field. BLS can result in unmarketable fruit. It is critical that spread of bacterial organisms be limited as much as possible. Avoid working in fields when plants are wet. When work is to be done in more than one planting, always work from youngest to oldest plants. This prevents workers from transporting bacteria to younger plants, where infections can result in increased crop loss. Remember that the earlier a plant is infected by a bacterial pathogen, the more likely it is to produce unmarketable fruit. 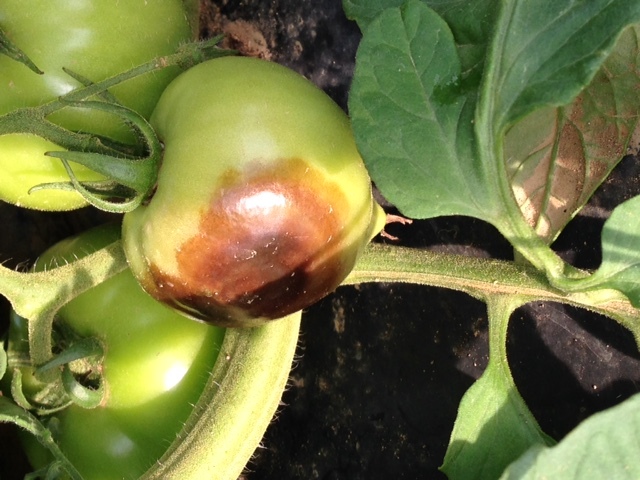 Another weather related tomato disease is buckeye rot (see photo). This disease of fruit is a Phytophthora infection of the same organism that causes crown rot in peppers and cucurbit crops. Tomatoes generally do not exhibit crown rot or foliar lesions, but fruit that are close enough to the ground to have infested soil splash onto them during hard rains may be affected. Infected fruit remain firm, but with dark brown rings developing as the infection spreads within the fruit. Buckeye rot resembles fruit infections from late blight, but in the case of buckeye rot, there will be no foliar lesions characteristic of lab blight. Infested soil will continue to result in buckeye rot if heavy rains continue. See the 2015 Commercial Vegetable Recommendations Guide for fungicide options.